The stately large house is in the Scottish Balmoral-Tudor style which makes extensive use of leaded glass, brick-and-stucco exteriors, and intricate slate roofs. Noteworthy on the main façade is the use of art tiles in a Tudor-rose and eglantine-tree of life pattern. A distinctive feature of the house is the sweeping gable on the lake side. In addition to the main three-story house (two floors are on tour on the Palm Sunday Tour), there is a similarly-styled garage with workshops and apartments in the rear, and a boathouse. 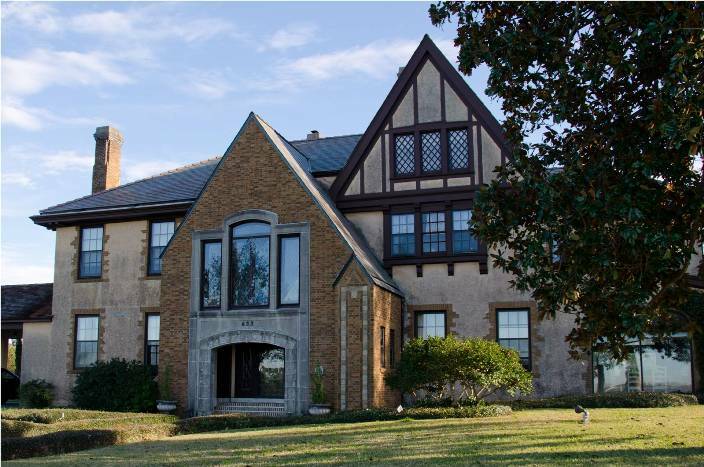 This property was part of an early Spanish land grant, and in 1907 this particular lot was bought by John L. Farque who had the house constructed for his new bride. In 1923, he sold the property to Charles Schrubbe. The Schrubbe heirs sold the house to Henrietta Clarke in 1958. Sue and Jack Watson bought the property in 1969 and the current owners, the Reinauers, in 1971. The property was mostly unoccupied from 1957 until the Reinauers bought it with the intention of using it as their family home. The house is a type referred to as a “raised-center hall cottage” and it was constructed of long-leaf yellow pine and cypress. 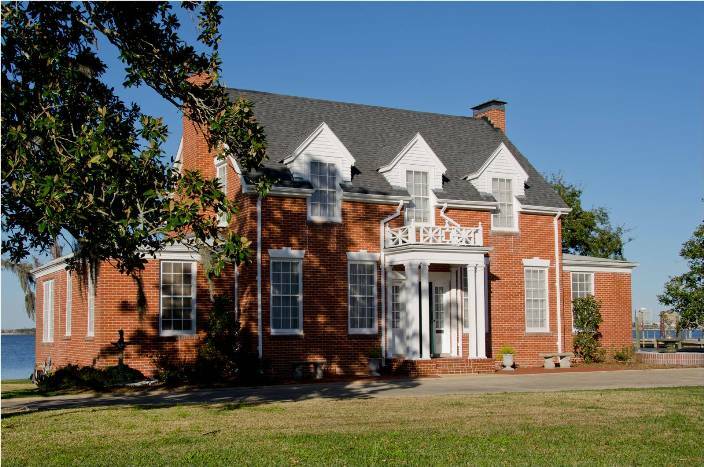 In 1984 the house was purchased by Dr. and Mrs. John Raggio who were pledged to return the house to its original look. They reconstructed the wooden porches, replacing the inauthentic concrete porches that had been installed in the 1930’s, and removed the outside metal staircase that provided access to the apartments. Much work was also done to upgrade the gardens and to furnish the interiors. 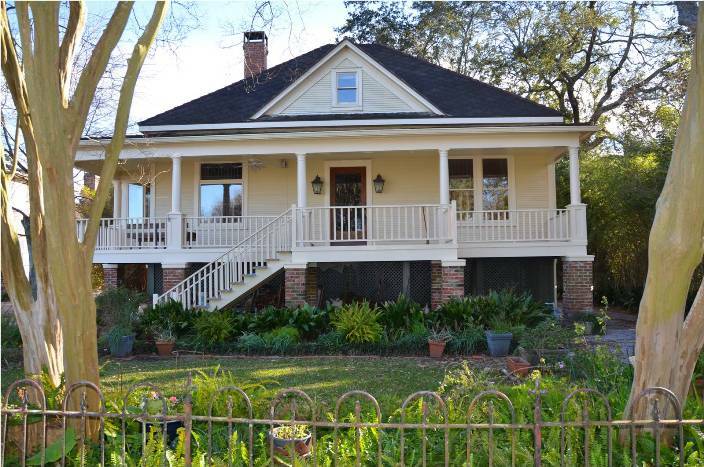 In style, it has been called an American foursquare with the added touch of broad double galleries. The original owners G. W. and Ruth Holleyman called the distinctive house at 1200 Shell Beach Drive “Lake Haven”. The house is built in the Georgian revival Tidewater style and occupies an acre lot directly on the lake. The one-and-half story red-brick structure was built for $11,400. All the wood used in the house is cypress, except for the white oak and red oak flooring throughout. The Holleyman’s granddaughter, Nancy is married to Wendell Fontenot, and they are the current owners of this treasure. 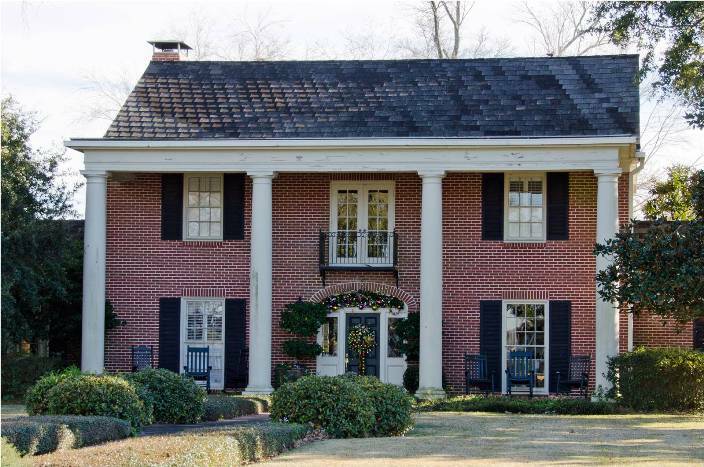 The 1947 brick house with four columns served the Digiglias and their two children Ellie and J. W. as the family homeplace for nearly 50 years. Interestingly, the house was featured in the February 5th, 1966 New Yorker magazine ad for Hiram Walker whiskey, due probably to its classic revival lines that harkened back to gracious times and stylish living. The elegant, understated interiors and furnishings are the work of the current owners, Claudia and James Boyer. Architect John Gabriel designed the home. In last year’s Margaret Place Tour, his 1953 design for the Gerard family (Molly and Gus Quinn’s home) was featured. In the 2011 Tour, his design for the Levy house on 11th Street (currently the home of Randy Foster) was on tour. 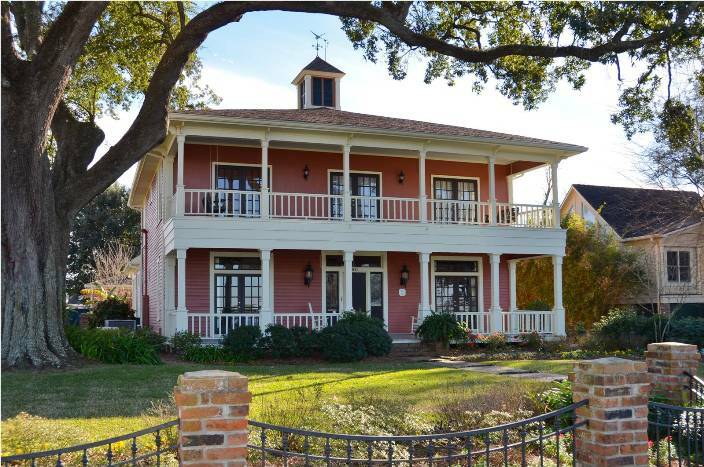 The Palm Sunday Tour of Homes salutes the remarkable legacy of one hundred year old John M. Gabriel, a pioneering area architect with hundreds of commissions in Louisiana and Texas..
Frontpage Slideshow is Search Engine Friendly! …And iPhone & iPad friendly too!